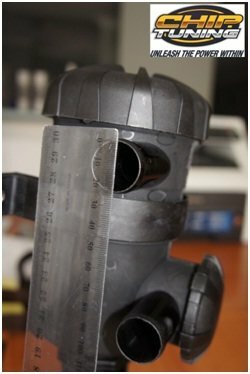 The common mistake made when buying an Oil Catch Can is that people are fitting units that reduce the size of the breather tubes. For the professional aftermarket parts developer the mantra is to keep to the same design performance as the OEM manufacturer … OR BETTER. By keeping to this set of guidelines, upgrading your vehicle with after-market parts will not compromise on safety or reliability. 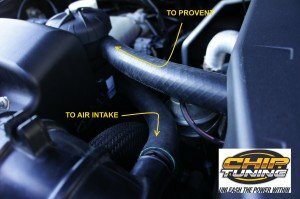 In this case on Positive Crankcase Ventilation (PCV) Systems keeping to the OEM manufacturer’s design rules means having no less an outlet breather tube size than original. Oil catch cans inlets and outlets need to be of the same diameter as that of the OEM. 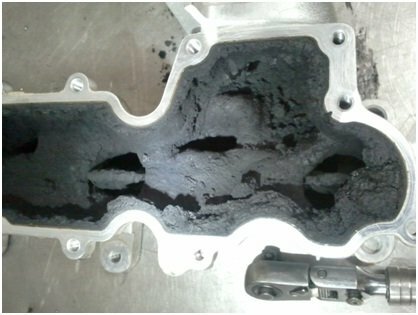 There is a reason for this: The manufacturer is concerned with keeping the crankcase free of pressure build up. Cheap $40.00 oil catch cans from eBay etc with have tiny 10 -12mm inlets/outlets, or fittings acting as reducers, reduce the flow rates of the PCV System thus causing back-pressure in the crankcase. This build-up of pressure causes engine oil to weep from the crankcase seals etc as they were not made to hold pressure. Pound for pound, diesel engines have more blow-by past the rings than petrol engines and thus flow through the PVC System is higher. We certainly do not want to hold back any pressure here. I have found one type of Oil Catch Can that fits the bill and we now how them in our product line up. 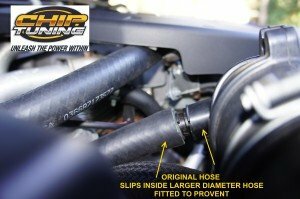 These specially made Hi Performance ProVent Style HP200 Oil Catch Can do an excellent job of filtering out the oil from the crankcase gasses that are re-entering the engine through the factory setup … and they do this WITHOUT restricting flow. In this picture above you can see the very large inlet and outlet size. Bigger than any other oil catch can! In my opinion, superior to any other style of Oil Catch Can for another reason as well. It has 2 relief valves. (most other types have none). One is situated on the inlet side to relieve high pressure, the other on the outlet side to relieve any low pressure. 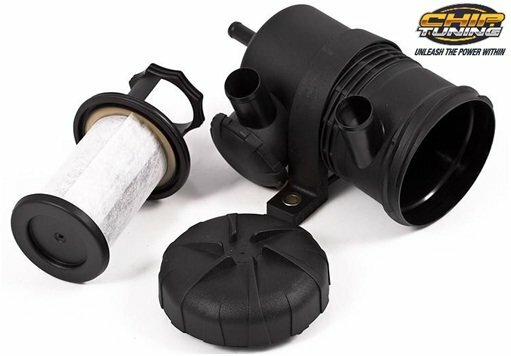 Again, this stops any pressure build up even if the filter becomes blocked from you not cleaning it. It’s a great engine safe guard! Firstly, oil mist in the air intake entering into the combustion chamber will reduce the octane rating of the combustible fuel. 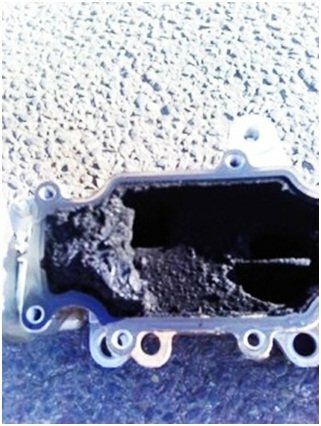 Mainly in petrol engines, this leads to a symptom called “pre-ignition”. Pre-ignition is one of the quickest ways to damage cylinder heads, piston crowns and piston rings. 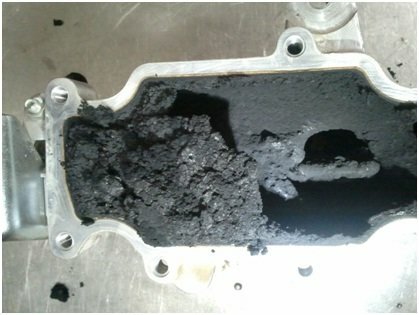 Secondly, (and the main reason) oil entering into the intake manifold combines with the heated gases of the Exhaust Gas Recirculation (EGR) (300-400 deg Cel) and literally bakes to form carbon build-up in the manifold. This carbon build-up, over a relatively short period, restricts the volume of air that would normally be allowed to flow through the manifold into the combustion chamber. (See pictures). The less flow, the less performance. 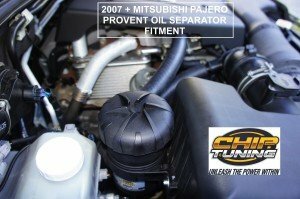 This is well noted on late model Mitsubishi, Toyota and Nissan vehicles. 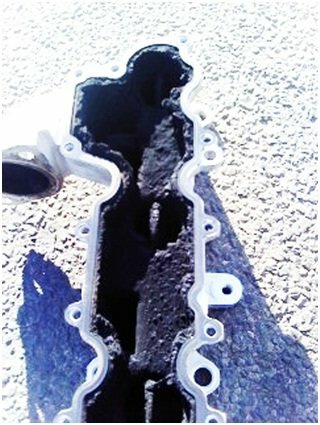 The pictures of manifold above were taken of a late model diesel’s intake manifolds having 160,000kms on the clock. 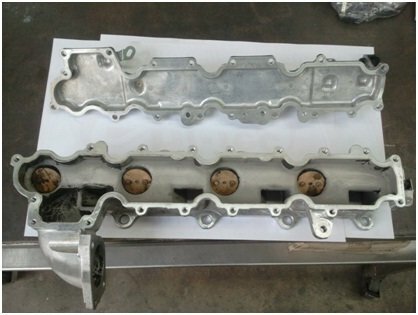 The last picture shows a CLEANED intake manifold. 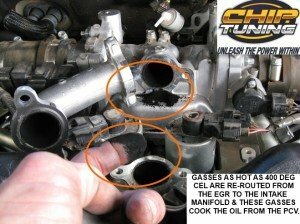 (same manifold as shown above in the first 3 pics) If you could start with this and add the Oil Catch Can then this would be best. Blocking the EGR System is also advisable. Looking at this pic above and comparing with the 3rd pic of the manifold it looks like No 4 cylinder was getting no air at all !! 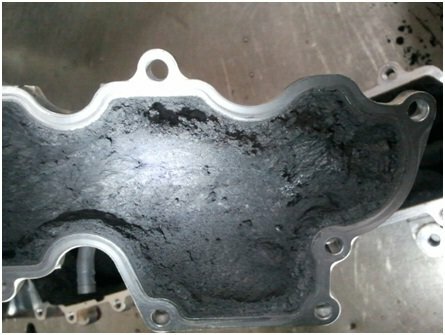 The modern diesel engine manufacturer’s idea of emission control that ruins your engine hoping that the problem occurs AFTER your warranty period has expired. They laugh all the way to the bank of course. 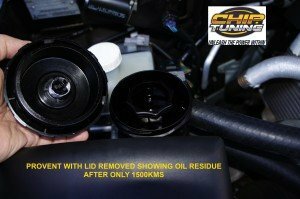 The Chip Tuning HP200 Oil Catch Can has a replaceable element. 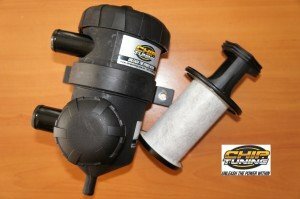 Maintenance on these is easy too since no actual fittings or pipework is removed to replace / clean filter element. 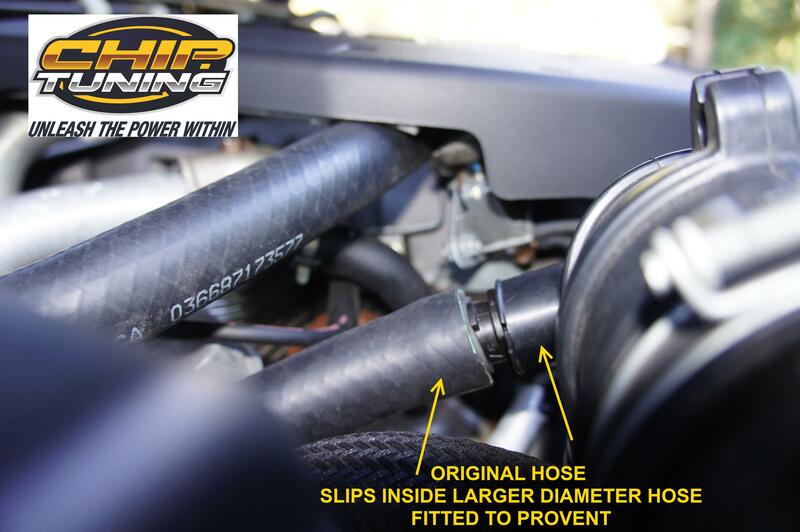 Keep Oil Catch Can hoses away from turbo or hot exhaust manifolds as much as possible. If a hose travels close to a heat source, shield it. There are arrows on the side of the HP200 to advise direction of flow. The top inlet is connected to the rocker cover (ie VAPOUR IN). 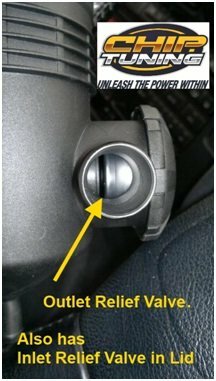 The bottom outlet is connected to the air intake. (VAPOUR OUT). 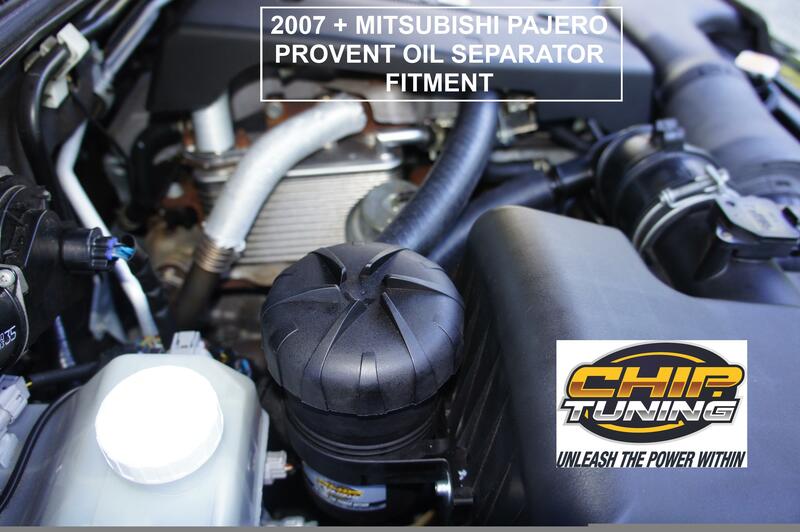 Oil Drain that can be capped off or returned to the sump. 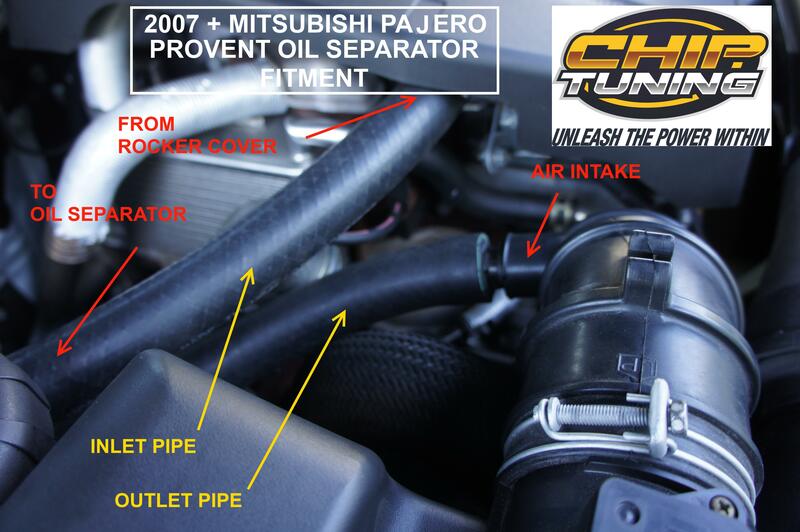 This totally sealed system makes the Oil Separator completely legal. NB: This item is a Chip Tuning recommended part and not to be confused with any other brand. If you are not 100% convinced this product is better than any other catch can simply return it within 7 days in new condition and in original packaging for a full refund (minus the freight costs).